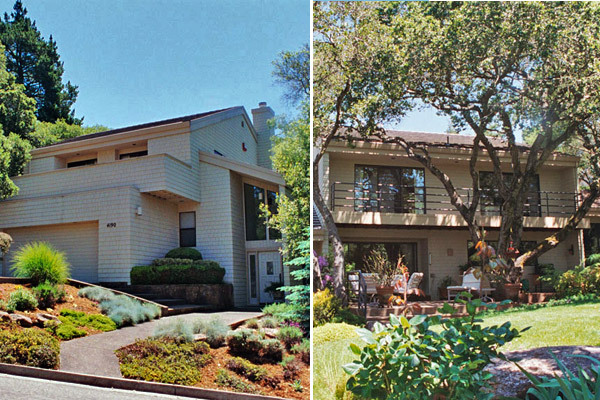 Designed and built for speculative sale in an upscale hilltop neighbor in Santa Rosa, the ACT I Residence is sited within the oak trees that are an important feature of this area. The street façade features interlocking forms that recede back to a high entry foyer bathed in natural light. The automobile and pedestrian entries are separated from each other by both elevation and distance from the street. The rear of the shingle-sided home features a full width balcony with steel railings that provides sun and rain protection for the lower floor. This balcony hovers in the branches of the rear yard’s oak trees and provides framed views through those trees from the bedroom level.